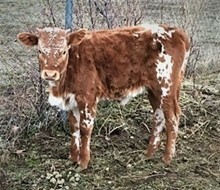 This cow has some unique color if you throw in some tri-colored spots, dun with brindle and a splash of white you have Bliss. She has a spectacular unique horn set that is rolling. She gave us a great heifer calf out of Lucky Malachi. She has some greats in her lineage such as Unlimited, and Gunman. Bliss and her heifer calf are consigned to the Fey Longhorn Sale.